After doing the 1MAD (23:1), it's still 16:8 today. So far I've done two 1MADs and so I'm done with this week's quota. It hasn't been so bad. Actually, sometimes I feel impatient and think, "you know what, I think I could do the whole five 1MADS already!" Yep, that means only dinner for five days. Of course it's easier said than done. Especially so if you're done with the quota and will now just be 16:8 for the rest of the week. 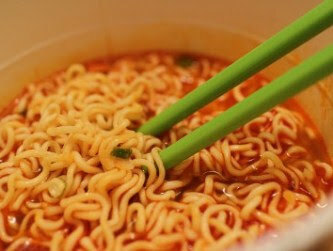 Today at around 4 pm, I had a packet of instant noodles. I thought it was a terrible idea. I just felt bloated even 3 hours after I've eaten it. It is so bad that I'm still trying to really feel and describe the experience. If I could only memorize the feeling, if possible, just so I don't repeat it. Because presently, I don't want to get this feeling anymore. What happened? Did my stomach shrink all of a sudden after 3 weeks of the change in eating pattern? Because I don't know how else to explain the bloatedness. Could it be the 2 1MADs last Monday and Wednesday? I have to admit that the 1MAD (One-Meal-A-Day) puts some stress on the body and it isn't easy the first time around. It's not that I'll throw-up any minute. There's no nausea. But there's a big feeling of heaviness and discomfort, not pain, in my tummy. Normally, I won't have qualms eating one pack of instant noodles. Heck, I'd probably snack on something else a couple of hours later! It got me scared actually thinking that I might have nightmares when I go to sleep. I've read of people dying of pancreatitis during the night after eating a high carbohydrate meal, notably noodles. Now, I sort of regret buying 6 packets of these kind of instant noodles. Gosh, what was I thinking when I bought those instant noodles? Maybe it's the thought that I would probably reward myself with some very satisfying snack or meal with all this intermittent fasting. I suppose it's some kind of a "reward" to satisfy that craving after a period of deprivation. Anyway, after this uncomfortable tummy bloating episode, I'm not sure if I'd like to eat anymore of this stuff. Maybe it's the MSG too. Maybe my system's way of trying to expel the "bad stuff". What will I do with them now? Open one during a 16:8 day like Sunday? Give them away? Just let them stay at the pantry until someone decides to cook-up a soup meal? But for now they're at the pantry. They could stay there until December. If they're still there by Christmas, I'm giving them away by New Year.